Learn Chinese. See the World. We help South Dakota students expand their perspective and gain an edge in the global economy with a Chinese language program that is practical, doable, and fun. Explore our culture center. Learn from a visiting scholar. Experience Chinese art and cultural performances. Even arrange to study in China. It's all here at the Confucius Institute at NSU. Students of all ages are welcome to enroll in Mandarin Chinese classes and attend Chinese cultural events on NSU's campus, in the Aberdeen community, and across South Dakota. Get your passport and join the adventure! Each summer university and high school students who have completed a minimum of 20 hours of Chinese are eligible to travel to China for a two-week language and culture camp at the University of Jinan. Students travel with a Confucius Institute staff person, joining others from across the world who also have studied Mandarin through their local Confucius Institute. The Confucius Institute Headquarters covers the in-country accommodations, travel and teaching fees. Students are responsible for costs associated with U.S. domestic and international flights to China, passport, visa and personal spending money during the study abroad experience. Contact us at confucius@northern.edu or request information to learn more about this amazing opportunity. A Chinese expert may be available to speak about China to your school or community group. We can present on a range of topics as well as demonstrate various traditional Chinese arts. We'll customize the presentation to your goals and audience. Please contact us directly at confucius@northern.edu. The Confucius Institute offers several Chinese language and culture classes! Please check the course schedules. Click below to visit the NSU course catalog for all courses. Each summer university and high school students are eligible to travel to China for a language and culture camp, joining others who have studied Mandarin through a local Confucius Institute. Each year Northern State University and the University of Jinan welcome scholars from all fields to study, conduct research or teach. Click below to contact us about these opportunities! Each year the Confucius Institute hosts Chinese performance groups, visiting artists and exhibits, lectures and classes such as Tai Chi and cooking. For events and news, follow us on Facebook. 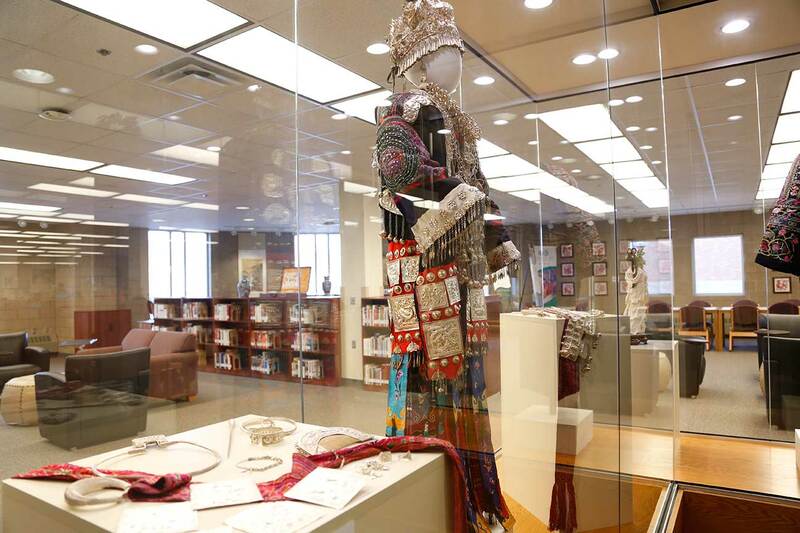 The Chinese Culture Center is on the main floor, west end of Beulah Williams Library on the NSU campus. Planning to travel to China? Browse through our collection of books about the major cities. Love Chinese cuisine? Check out a cookbook. Interested in Chinese novels, folklore, poetry, history, philosophy, religion and politics? We have a wide range of volumes on these and many other topics. The Chinese Culture Center offers visitors and borrowers a collection of more than 1,400 books on a range of topics and in a variety of languages, with new volumes scheduled to arrive each year. Here, you'll learn more about China through the Interactive Chinese Culture Learning Exhibit - a display of artifacts, traditional Chinese instruments and costumes of the Miao, a Chinese ethnic group. Spend some time with us, and bring a friend. Watch for updates and a calendar of events on Facebook.